The New Jersey Devils are looking for their first playoff series win since 2007, and there is a lot on the line for many of the Devils’ personnel. Zach Parise will be looking for his first series victory as a captain, while Martin Brodeur will try to finish strong as questions swirl around his future. Not to mention, Peter DeBoer wants to clinch his first playoff series win as a head coach. 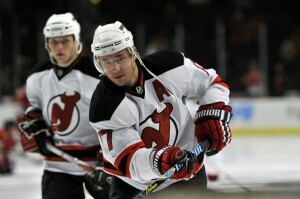 However, the outcome of this series is particularly important for Devils forward and alternate captain Ilya Kovalchuk. Kovalchuk has never won a playoff series, and this has held him back from being considered one of the league’s elite players. He was a member of the mediocre Atlanta Thrashers for much of his early career. The Thrashers only went to the playoffs once, in 2007, and were swept in the quarterfinals by the New York Rangers. Kovalchuk had two points in four games in that series. But upon coming to New Jersey he has found a better chance to contribute to a playoff run. In 2010 he had six points in five games to lead the Devils. Unfortunately the Devils were knocked out by the Philadelphia Flyers in the conference quarterfinals. Kovalchuk produced, but there was still an empty hole on his resume. This year he has once again shown that he can be one of New Jersey’s most productive players in the postseason. He is currently second on the team with five points, and first with three goals. He had two points in Game 6, a 3-2 New Jersey victory that forced Game 7, and has points in four out of the six games played so far. Kovalchuk is a reason for the success of the Devils’ power play in the postseason, which is ranked fifth in the NHL with a 22.7 percent success rate. He is second in the league with two power-play goals and ranks first on the team with 6:12 of ice time on the power play. In addition to this, he is first in the league in ice time at 25:21 per game, taking responsibility as one of the Devils’ key players. Although New Jersey needs this win to show it can still compete in the postseason, Kovalchuk perhaps needs it the most. He no doubt knows there is a monkey on his back. This is the first Game 7 of his career, so for a player who has never faced this before, the pressure is that much higher. One can only wonder how he feels knowing that the Devils are also under a microscope, as the fans are getting tired of first-round exits. However, he does not seem nervous, and can’t wait to experience a Game 7. His playoff totals with New Jersey show he can handle the increased spotlight of the playoffs, but he needs to get all the way over the hump to shed his questionable reputation for good. If he can come up with another Game 6 performance, the Devils will find themselves in the conference semifinals. But if Kovalchuk disappears with everything on the line, and New Jersey does not get contributions from players who were visible in the regular season but have disappeared off the playoff radar (David Clarkson has not scored a goal in the postseason, for one), the Devils will have a different reputation to deal with. A loss would mean they would become the team who gave the Florida Panthers a ticket to the semifinals for the first time since 1996. That alone could be more embarrassing than any of Ilya Kovalchuk’s personal failures, but he still wouldn’t be able to escape blame.